Improving our streams to combat drought in a changing climate. This page is not about the causes of climate change or about the outcome as they have been discussed on other pages but it is about some of the changes we can make to improve farming and food production and make our country more resilient in the future. Climate change is like a slow motion train wreck and there has been plenty of research and warnings (World Bank) which give us time to prepare. Unfortunately real life is not like that. A combination of short term politics and denials means that we have been ‘kicking the can further down the road’ and not doing much planning at all. Additionally the warnings from the IPCC and government scientists have been consistently conservative about the projected timing of changes to the climate and events are happening much more quickly than expected. Our big and resilient world is a lot more sensitive than we thought. Climate change and food production. The critical issues in our modern civilisation are food, water, energy and transport. Food and water keep us alive and energy and transport enable us to earn a living. Energy and transport have been dealt with here. Of all the various issues emanating from a warmer world the shortage of clean water and the resulting disruption to food production is the most threatening to life as we know it. What appears to be happening is that the increased temperature is drying the soil and also changing the wind circulation so that we get a different type of weather to that which we are used to. The major movers in the weather changes are the Hadley cell, the jet stream, drier soil and a warming ocean. They are mostly linked in some way but the outcome is unpredictable and it is not until it starts happening that the full implications are realised. In New Zealand research has shown us approximately what to expect and we have already have experienced mild samples of the future. There has been an increase in the proportion of westerly winds which have brought drought to the eastern areas where we tend to live and farm. Although most of us live in cities our lives depend ultimately on the natural world and the way we treat it is important to our long term future. There is always a cost when we draw resources from the natural world. When we cut down a forest for wood we release carbon into the atmosphere, we release topsoil which washes into the sea and natural habitat is destroyed. Fishing the oceans for food. Early development of New Zealand. New Zealand was settled by Europeans from about 1820 onwards and with a major influx of people around 1850 to 1900. The early settlers brought a Chartist mentality to the country which is still apparent and makes it such a fine place to live. 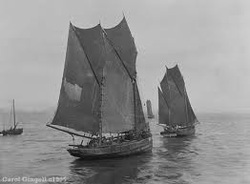 The Europeans came on large trading ships and brought modern equipment for farming and logging and quickly set about making a living. The woods were full of beautiful big trees such as the Kauri which could provide enough knot free, wide plank wood to build ten houses. The land was quickly logged and cleared and 80 million sheep farmed for wool. Cities, railways and roads built and civilisation as we know it was under-way. What we are left with is a land that has been cleared for farming and is not as resilient to the impending warmer temperatures and a reduction in rainfall as it could be. With five million dairy cows and five million beef cattle and each one making as much manure as seven people, plus forty million sheep, our small island is working fairly hard to cope. Rivers have not had a good time around the world. For a long time they were used as sewers to dispose of human and industrial waste but for about the last fifty years there has been a change of heart. Billions of dollars have been spent on rerouteing sewage pipes away from rivers and into sewage treatment plants. With the growth in population and wealth there has come awareness that rivers are a resource to be cherished, as a place of recreation and beauty and also a place to support nature in the natural world. We tend to take the natural composition of rainfall that fills our rivers and streams as a constant but like a lot of things today that is no longer the case. The big increase in the amount of nitrogen from cattle effluent is well recognised for the damage it does but acidity increases from the atmospheric are not so well reported and need just as much attention. It highlights the necessity of looking after the streams that we have and treating a healthy stream as a resource to combat increasing spells of drought caused by a warming world. A changing climate and streams. The rapid advance of climate change has brought a steady increase in droughts in more areas and this elevates rivers to a resource that has real value. It is used as a supply of drinking water for people and, most importantly, as a resource to irrigate crops, keeps pastures green and drinking water for cattle. This is not compatible with polluted water. Our estuaries are not as productive as they used to be as there is now a lot of silt in them where topsoil has been washed into the rivers and carried to the sea where it blankets the sandy fish breeding areas. A classic problem for farmers is that when the land was cleared it was done indiscriminately so that trees were taken out right to the edge and shade for the stream removed. With the tree cover removed, sunlight enters the stream and unwanted weeds flourish and clog the flow of water. The sunlight will also warm the water and as aquatic life is very sensitive to temperature a variety of creatures will die, destroying the food chain and the natural balance of nature. With the stream already in bad health, if there is a drought the slow moving water can become toxic and just when it is needed most it becomes a liability. With the banks cleared of growth there is nothing to hold the soil together and when it rains and the stream increases its flow rate it starts to erode the bank and carries the top soil to the sea. Ploughed fields are susceptible erosion with heavy rain washing soil down the furrows to the stream. This erosion brings two problems. The first is that It has taken thousands of years to make the top soil and it cannot be replaced so that over a period of time that land is lost to food production. The second problem is that this soil is deposited in the estuaries which are the breeding ground of sea water fish. The blanket of mud kills the sea grass and shell fish which are the habitat, breeding ground and food supply of fish and when the nursery is destroyed the oceans cannot be resupplied with fish. 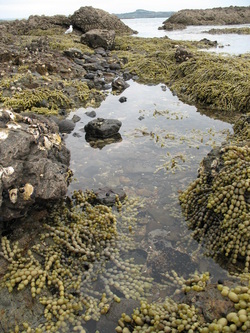 This rock pool is from the same estuary but about five kilometres downstream towards the sea. It is still healthy and full of seaweed, crabs, shellfish and anenomies. The lack of care of our rivers has a serious knock on affect to the natural world and is having adverse results on people’s lives. It also drastically reduces the resilience of the countryside to withstand changes to the climate. To improve the quality of a stream the first step is that it should be fenced to keep cattle out. 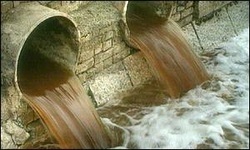 As soon as cattle enter they defecate and soil the stream. That is not good for the creatures in the stream and not good for cattle and people downstream. The fence should be about three metres from the bank to allow space for a credible bankside growth and natural habitat. This does not represent a loss of land as cattle normally trample the soft earth near the water’s edge and render it useless for pasture. With a fence, grass will grow abundantly right up to the fence edge. If the bank is planted to a pattern that replicates nature it would have ferns at the water’s edge with a low profile to resist floods and give shade cover for fish. The next row would be flax or Manuka as mid-range cover and at the back, on the fence line, some larger crown trees to give substantial shade. The two photographs are from the same farm as the photographs above but are three years later. It does not take long for streams to recover and with a little bit of help nature can recover. 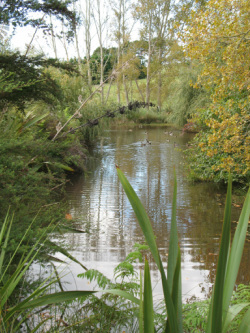 As the health of the river improves wildlife will return, the water table can be managed and clear cool water will flow in the stream. This work has turned a dusty cattle farm into good grass growing pasture which stands a much better chance of surviving a drought. What is not shown is the windmill that pumps the clean stream water to tanks at the top of the hill and from there the water flows to drinking troughs throughout the farm.